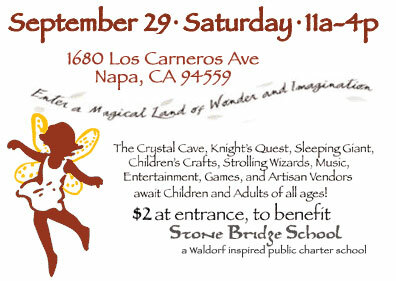 See you all for Enchanted Village Faire 2012! In the meantime click here for informatioon from last year! Stone Bridge School’s annual Enchanted Village Faire is part Renaissance fair, part school fundraiser and is open to the whole community. 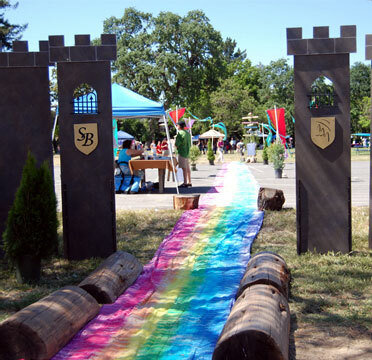 After fairgoers enter through the castle gates they can attempt to wake a sleeping giant or undergo a knight’s quest, just two of the many booths created and run by Stone Bridge parents and children. Stop at the Village Vittles for a bite brought to you by Chef Jeff Mosher (Executive Chef at Robert Mondavi Winery) and enjoy his beautiful seasonal dishes.Coffee donation by Starbucks. And, don't forget the Village Sweet Shoppe made possible by the families of Stone Bridge School. We will have gooey and delicious Carmel Apples, and Freshly Popped Popcorn. The shop will be filled with seasonal breads & muffins, savory biscuits and bagels, and a selection of cookies. We will also be serving coffee, iced tea, lemonade, and water.